Though the mechanism by which the enhancement takes place requires more study, the researchers believe the unique aspects of the TENG output - oscillating high voltage and controlled current - allow improvements in the ionization process, increasing the voltage applied without damaging samples or the instrument. The research, which was supported by the National Science Foundation, NASA Astrobiology Program and the Department of Energy, is reported February 27 in the journal Nature Nanotechnology. "Our discovery is basically a new and very controlled way of putting charge onto molecules," said Facundo Fernández, a professor in Georgia Tech's School of Chemistry and Biochemistry who uses mass spectrometry to study everything from small drug molecules to large proteins. "We know exactly how much charge we produce using these nanogenerators, allowing us to reach sensitivity levels that are unheard-of - at the zeptomole scale. We can measure down to literally hundreds of molecules without tagging." Fernández and his research team worked with Zhong Lin Wang, a pioneer in developing the TENG technology. 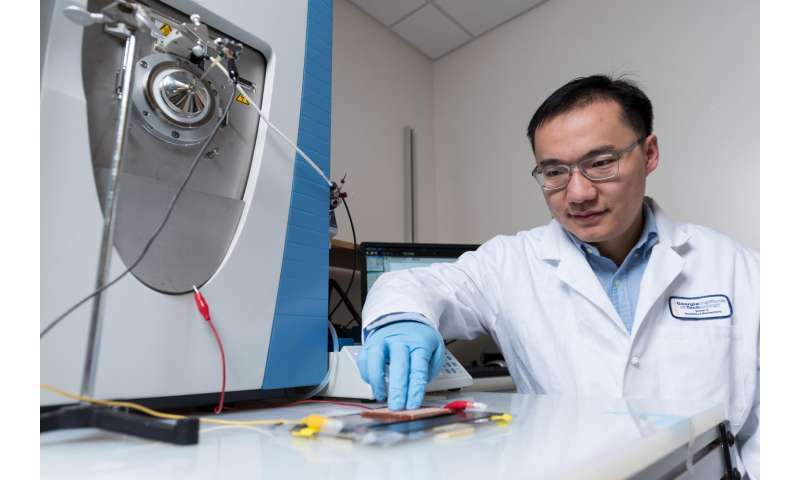 Wang, a Regents professor in Georgia Tech's School of Materials Science and Engineering, said the TENGs provide consistent charging levels that produce quantized ion pulses of adjustable duration, polarity and frequency. "The key here is that the total charge delivered in each cycle is entirely controlled and constant regardless of the speed at which the TENG is triggered," said Wang, who holds the Hightower Chair in the School of Materials Science and Engineering. 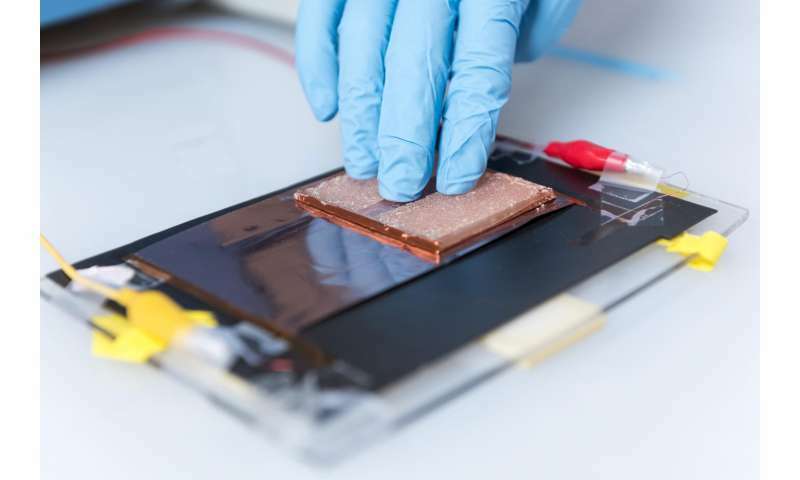 "This is a new direction for the triboelectric nanogenerators and opens a door for using the technology in the design of future instrumentation and equipment. This research demonstrates another practical impact of TENG technology." But in conventional electrospray mass spec techniques, as much as 99 percent of the sample can be wasted during ionization, said Fernández, who holds the Vasser Woolley Foundation Chair in Bioanalytical Chemistry. That's largely because in conventional systems, the mass analysis process is pulsed or scanned, while the ionization of samples is continuous. The new TENG pulsed power source allows scientists to time the ionization to match what's happening inside the mass spectrometer, specifically within a component known as the mass analyzer. Beyond improved sensitivity and the ability to analyze very small sample quantities, the new technique also allows ion deposition on surfaces, even non-conducting ones. That's because the oscillating ionization produces a sequence of alternating positive and negative charges, producing a net neutral surface, Fernández said. Mass spectrometers require large amounts of power for creating the vacuum essential to measuring the mass-to-charge ratio of each molecule. While it's possible that future TENG devices could power an entire miniature mass spectrometer, the TENG devices are now used just to ionize samples. "The nanogenerators could eliminate a big chunk of the mass spectrometer system because they wouldn't need a more powerful device for making the ions," Fernández said. "This could be particularly applicable to conditions that are extreme and harsh, such as on a battlefield or in space, where you would need a very robust and self-contained unit." 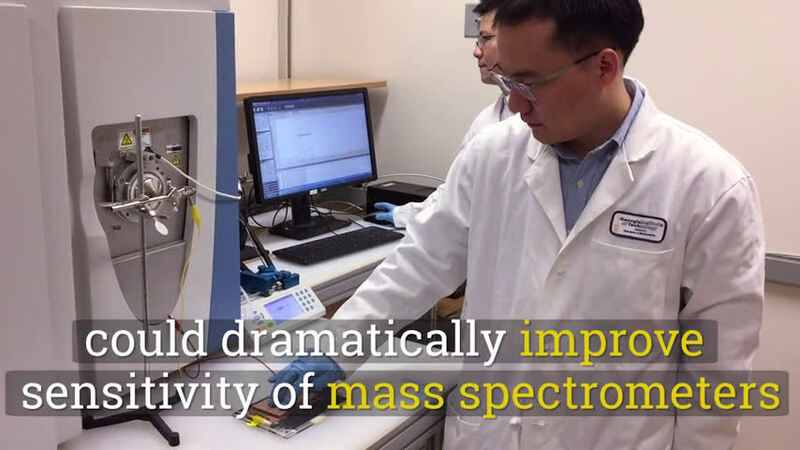 Wang's team has measured voltage levels at the mass spec ionizer of between 6,000 and 8,000 volts. Standard ionizers normally operate at less than 1,500 volts. The technology has been used with both electrospray ionization and plasma discharge ionization, with the flexibility of generating single polarity or alternating polarity ion pulses. "Because the voltage from these nanogenerators is high, we believe that the size of the sample droplets can be much smaller than with the conventional way of making ions," Fernández said. "That increases the ion generation efficiency. We are operating in a completely different electrospray regime, and it could completely change the way this technology is used." The TENG technology could be retrofitted to existing mass spectrometers, as Fernández has already done in his lab. With publication of the journal article, he hopes other labs will start exploring use of the TENG devices in mass spectrometry and other areas. "I see potential not only in analytical chemistry, but also in synthesis, electrochemistry and other areas that require a controlled way of producing electrical charges," Fernández said. The research was initiated by postdoctoral fellows in the two laboratory groups, Anyin Li and Yunlong Zi. "This project really shows how innovation can happen at the boundaries between different disciplines when scientists are free to pursue new ideas," Fernández added.